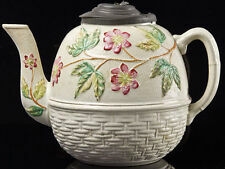 Henry`s Staffordshire Pottery Teapot with Summer Fruits design. Decorated in a beautiful mix of Summer fruits – this is a very elegant and eye-catching teapot. In very good condition. The exterior has no chips, cracks or crazing. The inside has no tannin staining, however there is a small area of crazing on the inner surface of the spout (see photograph). Dimensions :- Height 20 1/2cm. Max width of pot 16cm. Spout lip to handle 26cm. Capacity 2 pints. Vintage. MADE IN ENGLAND BY SUDLOW'S OF BURSLEM. IT HAS A BROWN MARBLE EFFECT BASE WITH A CREAM TOP DECORATED WITH GOLD GILT PANELS AND LEAVES. THE SPOUT AND HANDLE ARE IN GOLD GILT AND THE LID IS BROWN MARBLE. 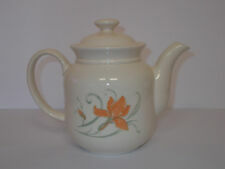 Churchill Mille Fleurs Large Teapot In lovely condition. No chips cracks or craze very little used. A small glazed over spot on the spout from manufacture minor but just so you are aware. Gibsons Silver Lustre Teapot Vintage 1940’s Dispatched with Royal Mail 2nd Class. In FABULOUS CONDITION! No signs of usage. Completely clean, Healthy ring, No chips, No cracks, No hairlines, No crackle. Just lovely! See all photos. Teapot stands 14cm tall. Made in Staffordshire, England. Retro mustard floral tea set. Staffordshire Potteries 1970s small tea set. Plain mustard saucer and plate, white cup with floral design. KERNOW FURNITURE LTD.
Royal Tudor Ware Teapot Barker Bros. West country design. This Churchill Jeff Banks Port of Call Kabul Coffee/Tea Pot is in superb as new condition. Yellow Jug-The Ridgeway Est 1792 Staffordshire Made in England. This beautiful tea pot from NORITAKE is in a pretty YELLOW FLOWERS pattern. Offered in excellent condition does not look as though it's been used. Holds approx 0.75 pint First quality item Postage and packaging for £3.99. Please note I post Tuesday - Thursday. 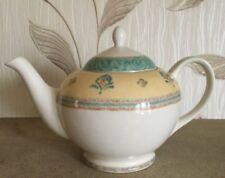 Antique Victorian Staffordshire footedteapot. Handpainted floral decoration of honeysuckles and rosebuds. made with love by. Item: This sale is for a pre-owned Churchill Imari tea pot and milk jug, with a pretty blue & orange floral pattern. Churchill Imari. Size: Teapot - approx 19cm tall. Jug - 9cm tall. Churchill Victoria Orchard China Tea-pot. In excellent condition. White Sudlow Burslem Antique Gold Floral Art Deco Teapot. Orange, blue and pink individual flowers on both sides of teapot with gold outlines of flowers all around them on a white background. Made in England. 21cm across (from handle to sprout) 13cm tall. 9cm base. Unusual Antique Teapot Having Green Body Decorated in Hand Painted Raised Floral Design, made By Mac Gibsons of Staffordshire. Base impressed Mac Gibsons,England plus a hard to see reg. Size---12 cms tall to top of finial. There is ONE (1) teapot and matching cover in this auction Cube shaped, decorated with the Crinoline lady's cottage garden floral sprays with gold trim In excellent used age old condition with no chip crack or restoration. Very very mild crazing to neck of lid finial It measures (14.5cm high to finial x 8.5cm wide x 19.5cm from handle to spout) With maker's printed/impressed marks and 1st quality. A very pretty design tea pot from teapot & co.
A new and unused 2 pint Jeff Banks 'Panama' design in two blues on white. No chips or cracks. See all the photos for proof of condition. Measures 17cms tall 27cms from the handle to the spout UK postage only. Use global shipping programme for international postage through ebay. Will be proof of postage and GPO tracked. Postage includes postage and packaging. Free local collection. 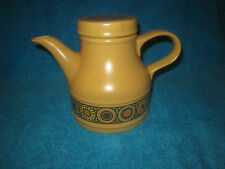 Biltons Retro 1980's English Recipes Teapot, Sugar Bowl, & Milk Jug. To Bake A Hare. 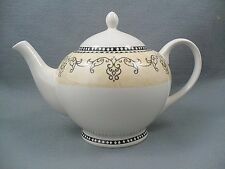 Antique Victorian Staffordshire teapot. made with love by. Antique Victorian Staffordshire imari teapot. made with love by. Gibsons Eden Teapot. A lovely teapot from Gibsons. There's so light scratches and speckles. 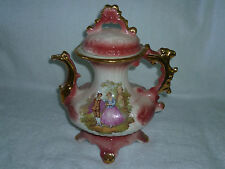 Vintage Gibsons Staffordshire Tea Pot Peach & Gold Colour. It is a peachy orange and gold colour. Also there is a tiny chip on the inside of the lid and a small crack on the handle. For overseas we can combine up to 2kg (maximum weight per parcel). As shown in the photographs. In Blue & White Queens Silver Jubilee Collection depicting Windsor castle. Stoneware teapot with silvered lid & spout, cream & blue glazed body with hand-painted trailing pink floral pattern. 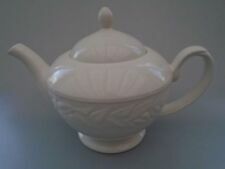 Its a very nice Antique Staffordshire England porcelain tea pot . CHURCHILL STAFFORDSHIRE. Tea pot in very good condition. Milk jug and sugar bowl in very good condition. The design is of plums and cherries on the jug, and strawberries and raspberries on the sugar bowl. CHURCHILL STAFFORDSHIRE. Vintage Royal Staffordshire Ironstone Tea Pot/coffee Pot "river Scene"